It's what's on the inside that counts, especially when we're talking about this ooey-gooey, chocolate dessert. 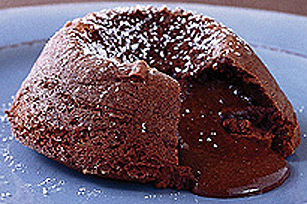 Our version of these molten chocolate cakes is surprisingly easy to whip up at home. Preheat oven to 400°F. Microwave chocolate and butter in medium microwaveable bowl on MEDIUM 3 min. or until butter is melted. Stir until chocolate is completely melted; set aside. Beat eggs, granulated sugar and coffee in large bowl with electric mixer on medium speed until thickened. Add flour and the chocolate mixture; beat just until blended. Pour into 6 generously greased and lightly floured 6-oz. custard cups; place cups on baking sheet. Bake 11 to 15 min. or until cakes are puffed with crusted tops, but still soft in the centres. Cool 5 min. Invert cakes onto individual dessert plates. Sift icing sugar evenly over the cakes. Serve warm. For a flawless finish, generously grease custard cups with shortening, then sprinkle with a combination of half each unsweetened cocoa and flour versus sprinkling the greased cups with just flour. Individual portions help you stick to the suggested serving size for this luscious chocolate favourite.